Have you ever seen Hitchcock's classic horror movie, The Birds? If so, I'm sure this 10" Raven Prop will trigger some fear in you. Add this prop to a scarecrow decoration or just have it sitting on your porch to freak out the trick or treaters. Every bride needs a bouquet. Even if you are a dead bride! Ask the Bride of Frankenstein for yourself. She would recommend walking down the aisle carrying this bouquet of 11.5 inch velvet roses. They look great in a creepy vase too. Most people think that black-feathered owls are just a myth. Boy, are those people wrong! Black-feathered owls are mythical beings that are rarely seen by people, but they really do exist. They are just really great at lurking in the shadows. This 14 Inch Black Owl will look great lurking in your room or den! Alot of people think birds are creepy, especially ravens! Creep out your guests by decorating your living room with this 18" Raven Prop. Look who's swooping in to spook you! This bat is usually a vampire but when he needs to get somewhere quickly, he morphs into a bat. Hang this creepy creature in a hallway or doorway. The dead are rising! 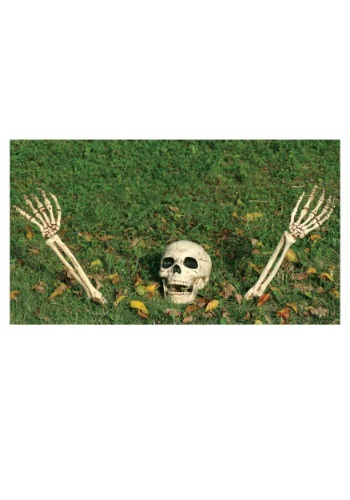 Scare the bejezus out of the neighbor kids and passerby's this Halloween by putting this 3 Piece Skeleton Kit in your yard. 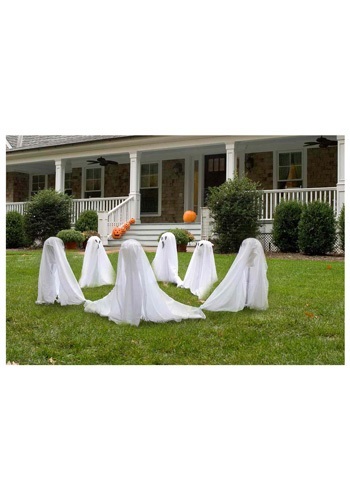 It's the perfect way to turn your yard into a spooky Halloween haunt! You can never have enough skulls in your life. Sure, you already have one in your head, but a few more to decorate your mantle or one on the book case never hurt anyone. No, really! Despite looking pretty realistic, this polyresin skull is NOT made from human bones, but you don't have to tell your friends that. It can be our little secret. Danny was always the annoying one in the office. Always needlessly nitpicking every decision. That's why when the zombie apocalypse struck we decided to hang him up as a macabre reminder of what happens when you get too close to a pack of roving zombies... Plus his decaying stench helps to ward off other undead walkers! This 55" Standing Boy is dressed for a formal party, but he unfortunately met with a mishap en route and never got there. Now he's doomed, for all eternity, to just stand and watch while others celebrate. And since he's no longer part of this world, nobody will even know he's there. No wonder he looks so forlorn! Now that you've gotten your 6 Foot Foam Cobra Snake here are a few facts to wow and impress your friends. Snakes are not hypnotized by music. In reality their ears are internal (we don't know why). When a snake charmer "charms" a snake, it is responding to the movement of the pipe not the sound. 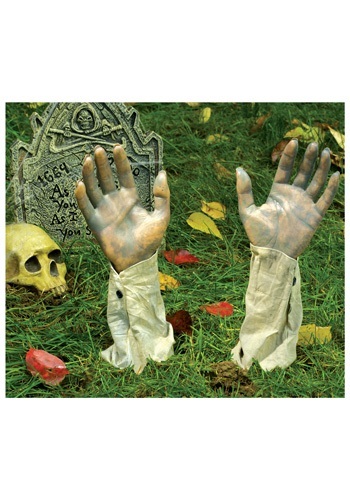 Take your haunted house or yard scene to the next level with a body bag decoration. It's large enough to hold an adult and can be unzipped from the inside and outside, offering lots of fun prank possibilities! Hey need a hand? This bag of body parts has a couple of them. This bag is filled with plastic dismembered body parts. Painted blood drips from the exposed bone. It includes 2 feet, 2 hands and 2 forearms. Use the assorted body parts around your house or lawn and keep your party guests wondering what they could find next. It's perfect for a haunted graveyard! Oh, what a lovely place for this crow to perch! Right on top of his owner... well, past owner. We won't discuss how the guy died, but the crow would like to state that he had no part in it. Do you believe him? Add this 6" Crow Looking Up on Skull to your den or laboratory! Who decided to call a group of crows a murder? It was at that point that crows started getting the bad rap of being super creepy and almost evil creatures. Have you ever heard their beautiful call that goes, "Caw! Caw! Caaaaaaaaaaaw?" Have you seen them flock majestically to a fresh animal carcass? Alright, so maybe crows are kind of creepy, but that's why we love them and this snow globe that has a murder of crows surrounding one giant crow. It's not really your Merry Christmas kind of globe. 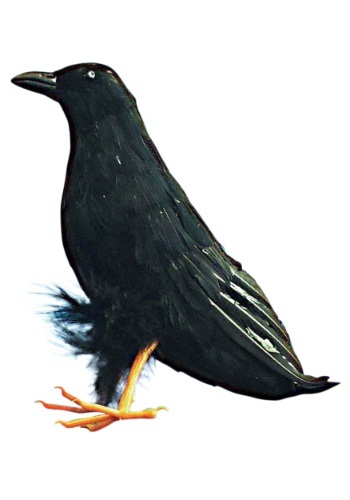 This 9" Crow is a decoration to go along with your creepy Halloween theme this year. It will make all of your guests think that you spend all of your down time writing dark poetry. Even if you're not that great with a pen, you can still look the part when you decorate your space with this prop! Jeepers creepers! 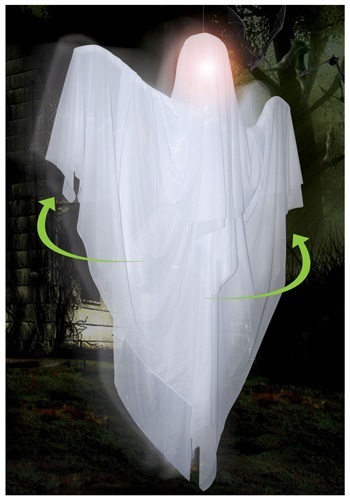 Give your holiday guests something scream about when you add this animated ghost to your haunted house. When your friends and family walk about this spooky specter they'll be treated to some flashing lights along with the scary sounds of this terrifying ghost. This Animated Hanging Zombie is perhaps the best-dressed zombie you'll ever see. Maybe he hasn't been one for very long and is relatively fresh. How else can you explain his satin clothes that aren't even dirty and torn yet? Think of all the ways you can use this Bag of Eyeballs. You could float them in a punch bowl. Or mix them into a bowl of popcorn. Or use one to crown a sundae or a mound of mashed potatoes. Or mix them into gelatin. NOTE: Of course, you'll want to wash them first, if you're going to do any of these things! Pull my finger! Jeez, you pulled it right out of the socket. You should have told us that you were tough guy. Just kidding! All these fingers are from a butchered up corpse so no harm, no foul. Keep them in the punch bowl to leave your party guests tickled. What's the matter? You don't want one of these furry little critters crawling into bed with you at night? Just check out all of those long skinny tails! 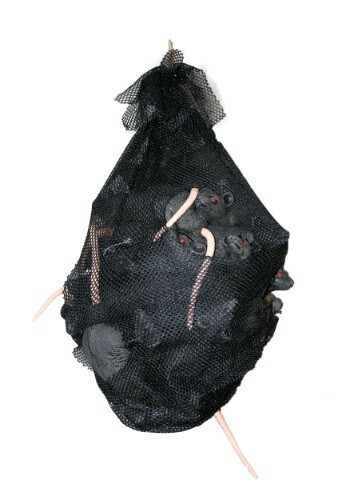 If you look at this Bag of Rats and say 'ick' then this is the prop for you because it's fun to be freaked out on the freakiest day of the year! Really up the wow factor of your vampire lair with this nylon bat. One or a couple of these will make sure that all of your guests know that you are top dog in your vampire circle. Plus, they're much easier to handle than real bats. Have you ever tried to get a bat to stay in one place? Good luck! When bats are curled up sleeping, they are actually very cute. They look like little fuzzy Hershey kisses. When they are flying from cave to cave, that's a whole different story. They look downright freaky! 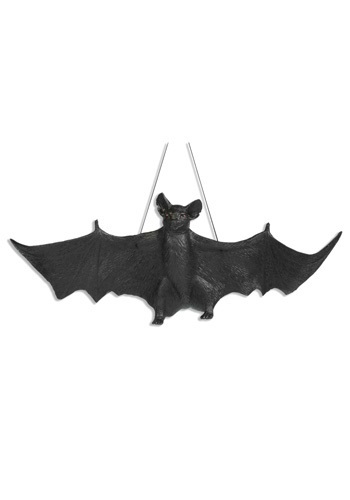 Freak out your guests by hanging this Brown Bat Prop on your porch or from your chandelier. This bat would love to watch over you while you eat. Add a some creepy crawlers to your home with these Cockroaches in a Bag. We know it'd be more authentic to have actual roaches but if you put them in your home they'll never want to leave. Think about it, these suckers can survive nuclear war, drowning and radiation. What makes you think they're afraid of you? You don't need a bag of live roaches to give people a fright. And anyways, we're pretty sure shipping live roaches would be a crime. So save on exterminator bills! He detests the term 'walking dead,' well, because he can't walk! But don't let this legless zombie fool you. He'll still get you and he'll still eat your brains! This Crawling Zombie Torso prop really moves. It makes sounds, lights up, and is sound activated. You better get a move on or he'll start munching on your toe! Eeeeeek! You'll most likely hear a lot of high-pitched squeals when this motion activated prop is in your home. The poor little guy was just trying to get to the piece of cheese, and SNAP! He never did get that piece of cheese. 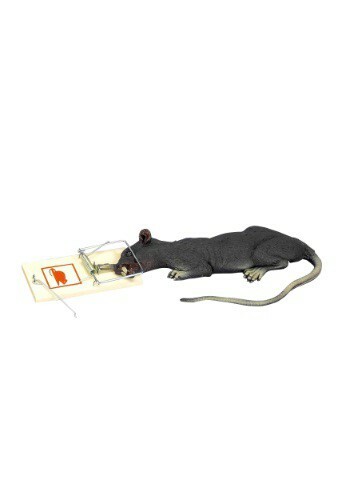 This Deluxe Rat In Trap w/Motion has a large tail, gnarled teeth, and beady eyes just like a real rat. Remember that cute teddy bear you had when you were a kid? We think this Feral Fuzzy White Bear ate him for breakfast and then used his remains for some kind of evil ritual. The little guy comes complete with creepy glowing eyes and the finger of his last poor victim. Only get him if you want to have nightmares that involve plushie animals doing awful things to people. If you're into that sort of thing, then this little guy is perfect for you. (We also recommend keeping him away from kids, unless you want to instill an irrational fear of stuffed animals in them). You'll have a hoot with this decoration. Perch this cute Flocked Owl decoration anywhere to add an element of spookiness to your home! This is an indoor decoration that looks great on the mantle! Your Foam Sitting Black Cat will stir up various meanings. Keep in mind, we didn't make these up:1. At a funeral procession meeting up with a black cat means the death of another family member. 2. Black cats in your dream...totally unlucky.3. Black cats are witches in disguise, or witches reborn.4. If a black cat walks towards you, it brings good fortune, but if it walks away, it takes the good luck with it!!! Go ahead, give him a kiss...you know you want to! Who knows, he might just be your Prince Charming in disguise. This Foam Toad Statue will look great in a garden or on a porch. He is made from soft spongy foam so he really looks and feels like a real toad. Ribbit, ribbit! If all the ladies at your party start screaming and climbing on tables, it's probably because they just saw this furry rat decoration! The realistic-looking rat is a furry decoration with orange eyes, whiskers, and a long black tail, and is a great addition to any pirate, haunted house, or dungeon scene. Add this inexpensive accessory to your Halloween house! Perched above an arched doorway or up against the wall, this creepy gargoyle can see it all. He looks like he is made out of stone, with the exception of his eyes... he has human eyeballs! But, I wouldn't ask him who he stole them from if I were you. Make your yard extra spooky this Halloween with the help of a spooky ghost. When this grinning ghosts is flying around your yard you'll have the neighborhood kids screaming in joy. So make your yard the place to be this holiday with this great decoration. If you want to turn someone into a mouse, a polyjuice potion will do the trick. But you need to add a few hairs from a mouse to complete it. So keep this Glass Bottle w/ Mouse on hand, so you'll be ready when the need arises! 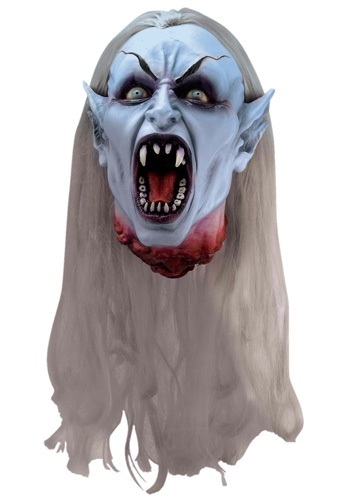 Display your latest conquest, this Gothic Vampire Head. By day you're a mild manner (insert job title here). By night you're a vicious vampire hunter, stalking your prey with a supernatural hatred. Creatures of the night beware. From the great beyond comes a pair of restless hands hungry for blood and searching for you. Why or how he got into your front yard no one knows. All we know: you'd better bury him again or you'll end up just like him...dead! *whooo whoo oooo* The zombie apocalypse has begun... Before you arm yourself for the impending battle be sure to take care of this pair of arms peeking up through your yard. You're not completely batty... this bat decoration isn't real, it just looks really realistic. 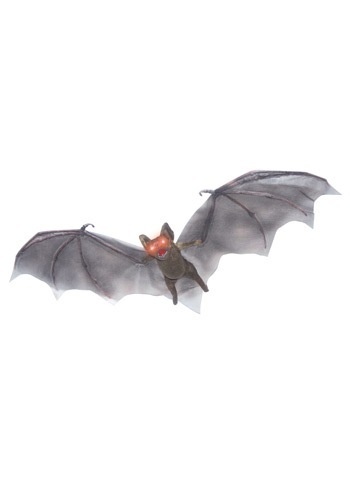 This bat most likely has rabies since his eyes glow red, so just beware! Lots of old houses or churches have bats in the belfry. You can, too, when you get this Hanging Bat Decoration. Get several, and have your own cloud of bats! Turn your home into a house of horrors with this grotesque decoration! The bloody foot decoration is made of plastic, molded into the shape of a severed foot. The top of the foot features details like a jutting leg bone and bloody muscle. A large plastic shackle with a plastic chain is attached at the ankle with a metal screw. Hang it up in any room to let your guests know of the terror about to unfold. This zombie is getting tired of hanging around! This Hanging Bloody Zombie can be hung indoors or outdoors by the rope that is attached to his hand. He is wearing a tattered blood stained plaid shirt revealing his bloody torso. He only has one bulging eye and an open mouth that appears to be screaming. 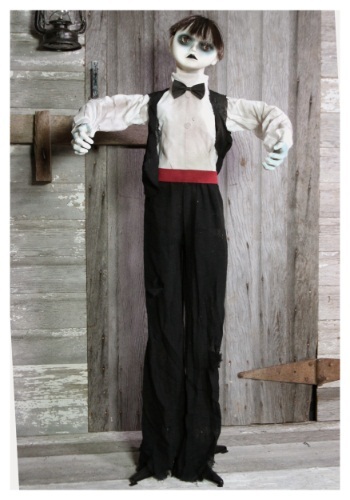 Get this Hanging Bloody Zombie for your home for a haunted effect! It looks like a vampire has transformed into a bat and is flying off into the night. Maybe it's Dracula? 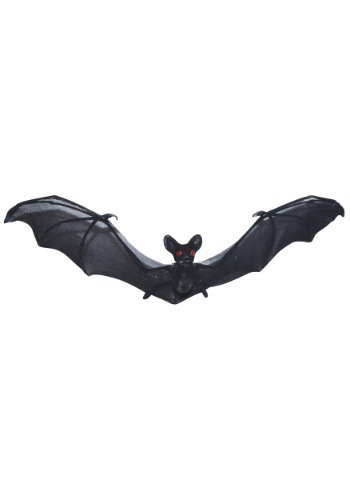 Scare the bejesus out of your house guests when you hang this Hanging Brown Bat-Eyes Light Up! This decoration can be hung indoors or outdoors. Your haunted house or graveyard scene won't be complete without a ghost or two hanging around! Add this ghost decoration to any scene for any instantly scary look. It's the perfect touch to give chills to your guests! Give your home a scary legend when you add a spooky ghost to your house. When any of your friends sees this ghost hanging from your ceiling they'll no doubt scream and be haunted by her bloody eyes for ever. Be sure to look at our other great scary decorations to complete your haunted house this Halloween. You're friends will be begging you to call the Ghostbusters when you hang this ghost up in your home. This floating spirit is sure to have others questioning whether on not they 'ain't afraid of no ghost'! She's back from Hell to get revenge on those who hung her during the Salem Witch Trials and she's going after their ancestors! She shows no mercy and can't wait to boil little trick or treaters into a stew. 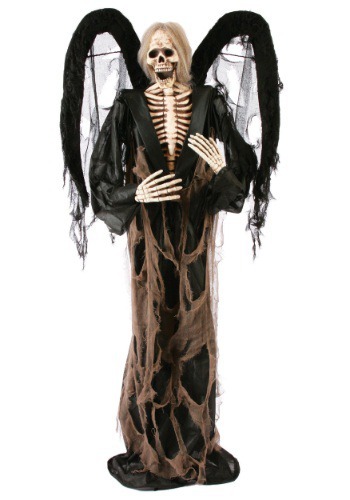 Hang this Hanging Shaking Witch decoration on your porch to hear some shrieks! These Hanging Head props will really add a frightful touch to your party scene! Whether you envision your living room as a voodoo lair, a haunted laboratory, or even a dark dungeon, these props will be the perfect touch! Set them up for a great night of spooky fun.